The most recent round of white-tailed deer antler measuring conducted by the S.C. Department of Natural Resources revealed 246 new records, including one Boone and Crockett qualifier. Each spring S.C. Department of Natural Resources (DNR) Wildlife Section personnel make a concerted effort to measure deer racks throughout the state, with a major session during the Palmetto Sportsmen’s Classic in Columbia. Of the 607 sets of antlers measured this spring, 246 met the minimum score for entry on the state records list including 237 sets of typical and 9 non-typical racks. According to Charles Ruth, Deer/Wild Turkey Program coordinator for DNR, behind last year, the number of successful entries into the records list this year is the second highest number of entries in over 15 years. Although all of the records were not taken during the 2012 season, 208 were taken during the 2011 or 2012 season. Racks must score a minimum of 125 points typical or 145 points non-typical to qualify for the South Carolina state records list. Records are based on the Boone and Crockett Club scoring system, which measures the mass and symmetry of deer antlers in two categories—typical and non-typical. The top typical buck was a 164 0/8 inch buck taken by Danny Dillard in Abbeville County in December of 2011. 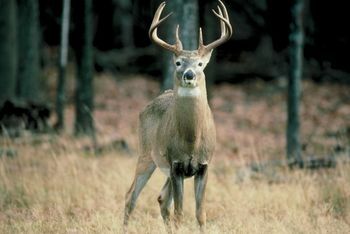 Dillard’s buck qualifies for the Boone and Crockett Club’s Three Year Awards Period List and is 14 among South Carolina’s all-time typical deer. The second highest scoring typical was a 159 1/8 inch Williamsburg County buck taken by Wendell Fulton last October. Netting 169 1/8 points, the top scoring non-typical buck was taken by Jere Kirkley in Anderson County last October. For the third year in a row, Aiken County was this years’ top producer of State Record entries with 33. Other top counties included Orangeburg (18), Anderson (12), Williamsburg (12), and Greenville (11). These results come as no surprise as these counties have historically produced good numbers of record entries. As far as all-time leaders at the county level, Orangeburg County remains at the top with 447 sets of antlers on the list. Rounding out the top five counties Orangeburg is followed by Aiken 421, Fairfield 255, Colleton 241, and Anderson with 238 entries. Currently 6,168 sets of antlers (5,936 typical and 232 non-typical) are included on the South Carolina antler records list. Results of DNR’s Antler Records Program for 2013 is available.